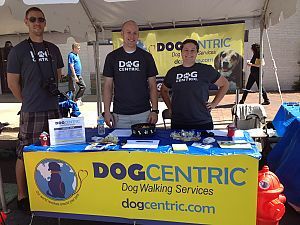 DogCentric was founded in 2005 by a dog-lover who could not find a dog walking service for her precious pooch that met her high standards to keep her dog happy, healthy and safe. She left her job in the corporate world to form a dog walking company that provided individual, customized visits for furry family members. By assigning each client a regular walker, you can count on your dog’s routine to be consistent, your dog to be lovingly cared for and treated like more than just a pet. DogCentric Dog Walking offers customized, private visits that are tailored to your dog’s preferences. These visits provide a much-needed break during the day for dogs to get exercise, fresh air and a bathroom break. You have peace of mind knowing your dog is being cared for while you are out during the day. You come home to a calmer, happier dog at the end of a long day. DogCentric walkers follow the routine developed by you and the manager at the initial consultation. Our management team is available to our walkers to help them through any situation they might encounter, leaving the walkers free to completely focus on the happiness, health and safety of the dog in their care. With more than 7,000 members, PSI is the knowledge leader in house-sitting and pet-sitting services; offering members education, support and training. The mission of the National Association of Professional Pet Sitters (NAPPS) is to support members' businesses, promote the value of pet sitting to the public, and advocate the welfare of animals. The Greater Bethesda-Chevy Chase Chamber of Commerce's mission is to build an environment that encourages business to grow and prosper within a thriving Bethesda-Chevy Chase community. DogCentric is Licensed, Bonded & Insured for your safety. Happy We know your dog’s routine, personality & favorite tree to sniff! Healthy Regular exercise is essential to your dog’s well-being. Safe You’ll have peace of mind knowing your dog is well-cared for. Content Copyright © 2019, DogCentric, Inc.